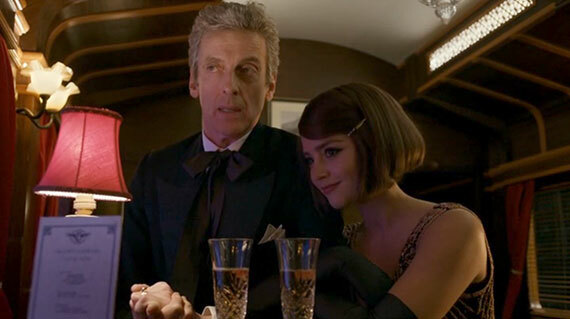 The Story So Far: Clara agrees to go off with the Doctor on one “last hurrah”, so he takes her to the Orient Express — in space. 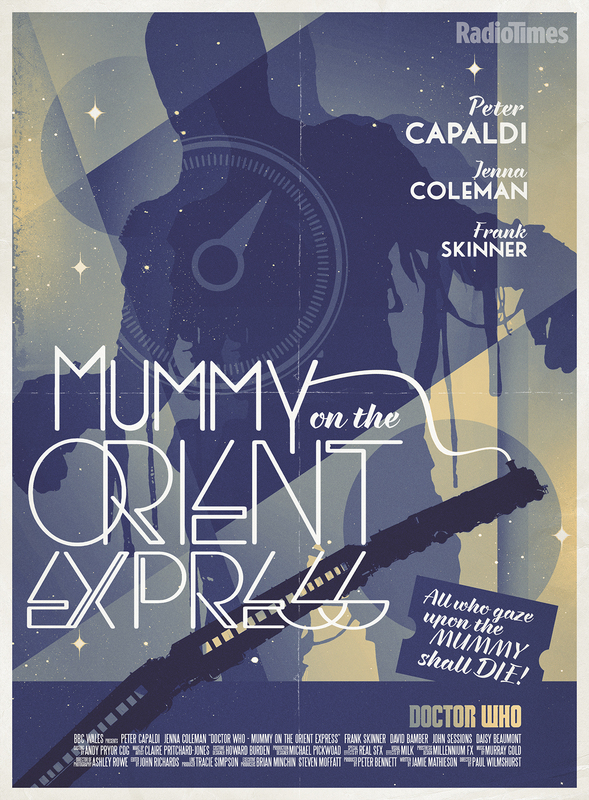 And there’s a mummy on the Orient Express. Finally, an episode that everyone seems to love unequivocally! A couple of episodes ago, we touched on the distinction between “rad” and “trad” stories. This dates to the 1990s, when the books were our only new Doctor Who product. “Rad” books played with the format, didn’t respect the old boundaries, and told stories in which the Doctor and his TARDIS were often only minimally present. The New Adventures were very “rad”. “Trad” books played it safe, bringing back old monsters behaving in the same old ways. 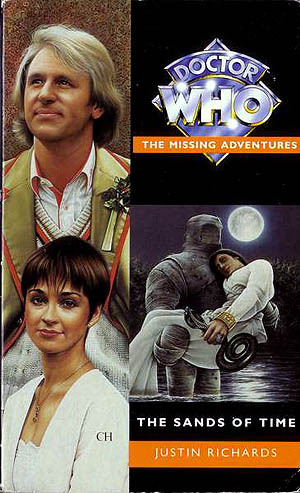 The Missing Adventures were very “trad”; 1996. dubbed their “Year of the Sequel”, included The Sands of Time — a direct sequel to Pyramids of Mars, and about as “trad” as a Doctor Who story could get. Not the only depiction of a mummy in this post. Mummy on the Orient Express is in most regards a very “trad” story: Agatha Christie meets the Mummies — i.e. quite possibly the most 4th Doctor story idea ever replicated. Episode writer Jamie Mathieson, a first-timer, even admitted on his blog that his first exposure to the show, back in 1975, was that archetypal Hinchcliffe-era serial, Terror of the Zygons. But, in this instance, “trad” turns out to be a very good thing. Other than that line, the most obvious influence on this story is 1975’s Pyramids of Mars, which also featured prominently in our discussions of Into the Dalek and Kill the Moon. These allusions are not coincidental; Pyramids, with its “1980, Sarah, if you want to get off” line, and Tom Baker’s alternately moody, expansive, chatty, and alien take on the Doctor (a radical change for the character at that time), is being mimicked openly and affectionately this season. Hence the mummy stalking the corridors of the faux-Orient Express, picking off a cast of Edwardian characters one by one. The Agatha Christie element is also not new; during the Hinchcliffe era, passengers in an enclosed space were also picked off by relentless, slow-walking killers in 1977’s The Robots of Death. And, just in case you’d missed it, there was one last big enormous shout-out to Tom Baker, when the 12th Doctor pulls an expensive-looking cigarette case out of his coat, and opens it up to reveal… well, not cigarettes. I’d also be remiss in pointing out that the cold open, which reveals that the stately Orient Express is actually in space, mimics the end of Part One of 1983’s Enlightenment, where an Edwardian racing yacht is also revealed as being in space. If you’re going to plant your roots in the Classic Series, Pyramids and Enlightenment are fine places to start. 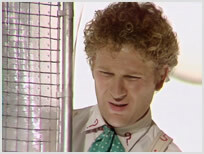 I’ve seen several commenters compare Capaldi’s decidedly anti-hero take on the Doctor, to Colin Baker’s 6th Doctor. Colin Baker’s stated that he meant his Doctor to appear abrasive and off-putting, if not villainous, in the beginning, only to gradually soften over time and be revealed as a noble good-guy, a la Mr. Darcy in Pride and Prejudice. However, Baker’s first seven TV serials (1984’s The Twin Dilemma through 1985’s Revelation of the Daleks) were so poorly conceived, written and executed, that Baker’s Doctor came across only as one-dimensional violent jerk, given to overwrought posturing. After Season 22 came an 18-month hiatus; when that ended, Baker’s intended Doctor was finally given its proper portrayal in 1986’s Trial of a Time Lord season — but it was too late, and Baker was sacked from the role, leading to a chain of production decisions that ruled out his even getting a proper on-screen regeneration. Since then, Baker’s Doctor has been substantially rehabilitated over the years through the Big Finish audios; since 1999, he’s made the 6th Doctor a true fan favorite. All this is to say that, up til this week, there’s been no overt influence of the Season 22 6th Doctor on Peter Capaldi’s portrayal of 12th. 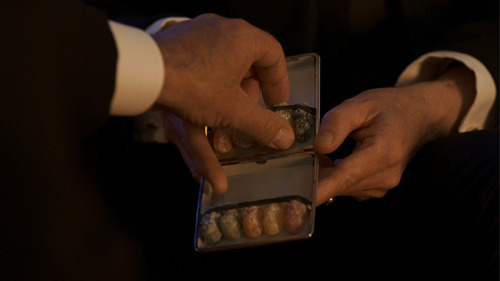 Capaldi’s character contains far more personality facets, with numerous lines of dialogue and personality quirks (the yo-yo, the jelly babies) drawn directly from Tom Baker’s first three seasons. However, the first half of Mummy on the Orient Express does closely mirror the Terror of the Vervoids segment of Trial of a Time Lord (Parts Nine through Twelve). There’s the hidden killer on the space liner; the nearby black hole (which, disappointingly, the Space Orient Express never gets drawn toward, even though it’s shown so prominently early on); and the grouchy Captain trying to shuck off his job responsibilities so he can retire in peace. 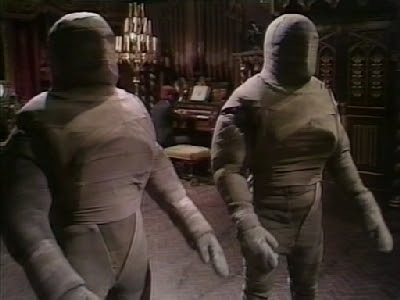 Vervoids and Mummy are cousins, not directly related, but for fans of the Classic Series, it’s an interesting parallel: two different takes on the same source material; one over-lit and with dreadfully realized monsters, the other more claustrophobic and menacing, but both with strong casts. And in both stories, the first cast member to buy it is an old codger whom you ‘llinstantly recognize from a previous “Doctor Who” appearance. The Foretold is a terrific idea for a monster-of-the-week. It’s a slow-moving mummy, with unraveling bandages, that can only be seen by its intended victim. Once it appears, the victim has exactly 66 seconds to live. And, because this episode pivots in its second half, the poor beast is given nobility and dignity — it’s merely a pawn in some other entity’s game, and gets to die with honor. As in Kill the Moon, it’s a monster that isn’t. The Foretold sees right through the 12th Doctor’s brusque, callous facade. Mummy on the Orient Express features several well-developed supporting roles for its cannon fodder. The Classic Series used to be good at this, particularly during the Hinchcliffe years, when each serial had just 4 to 6 speaking parts beyond the regulars. The New Series tends to derive its emotional beats from the regulars, at the expense of the guest cast; Mummy is another Hinchcliffe throwback in that regard. I recognized Janet Henfrey right off the bat from 1989’s The Curse of Fenric. As we established with my difficulty telling Michelle Gomez from Keeley Hawes in Time Heist, I’m usually terrible with faces, but not this time. In plain language… doubt and indecision! 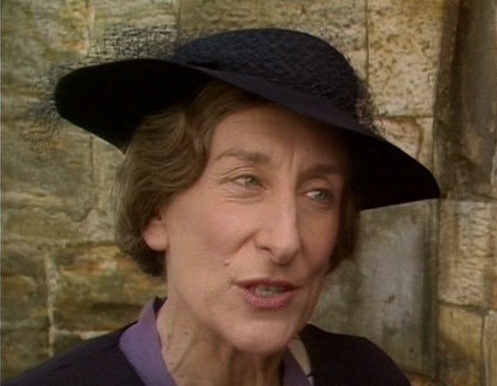 Last week we discussed how Tony Osoba was now oh-for-three in surviving his Doctor Who stories; Ms. Henfrey is now oh-for-two, playing two different kinds of bitter old lady and providing very good death scenes each time. She’s here for literally less than a minute but it’s a bravura performance for that short time. Jamie Mathieson’s blog says wonderful things about her … which doesn’t stop him from revealing that wicked Mrs. Pitt poisoned her granddaughter Maisie’s pony (and Maisie’s dad, too). Two returning actors I did not recognize. First, Christopher Villiers, last seem as a callow medieval jouster in 1983’s The King’s Demons. 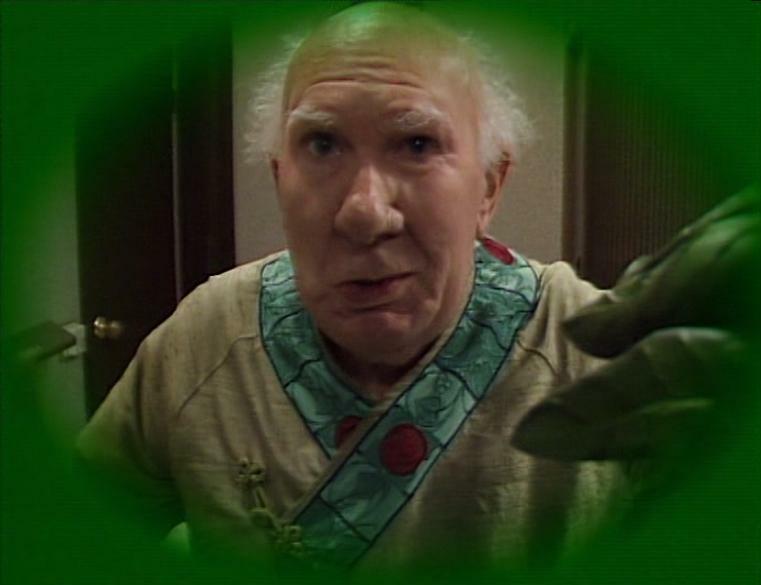 He’s quite good here as Professor Moorhouse, the professor of alien mythology who travels in space because he wants to meet a monster; by and large, he’s a sympathetic character meeting a very undignified end. And that’s John Sessions as the voice of Gus; I’ve never experienced Mr. Sessions’ turn as the bad guy in Death Comes to Time, an off-canon, Flash-animated Who webcast that came out during the Wilderness years, when my old dial-up Internet connection couldn’t properly play the thing. 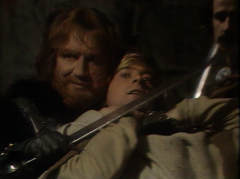 A much, much younger Christopher Villiers, suffering at the hands of a cunningly disguised Anthony Ainley (The Master). 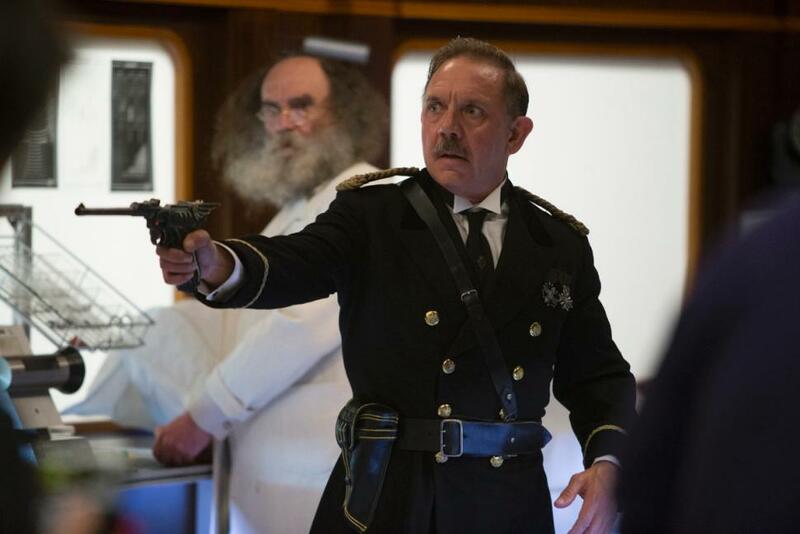 David Bamber, who plays Captain Quell, also played Hitler in that Tom Cruise movie. That makes Bamber another link connecting this story with Pyramids of Mars, which guest-starred Michael Sheard. Sheard played Hitler five times, including the time he autographed Sean Connery’s Grail diary for Harrison Ford. David Bamber meets another alien menace that’s not immune to bullets. The Doctor: Ah, well, on a good day, I’m both. 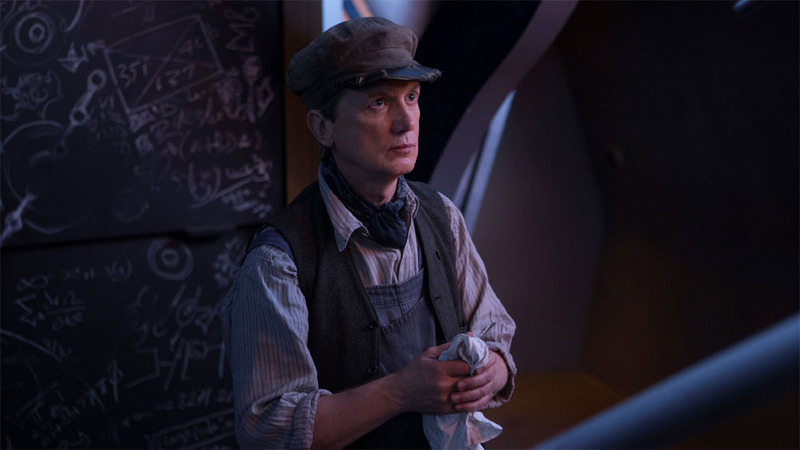 The episode’s principal guest star is comedian Frank Skinner (last seen in The Five(ish) Doctor’s Reboot), playing Perkins, Chief Engineer to the Orient Express. Skinner and Capaldi have a darkly comic chemistry, of the kind that William Hartnell used to have with his principal guest stars back in the day. 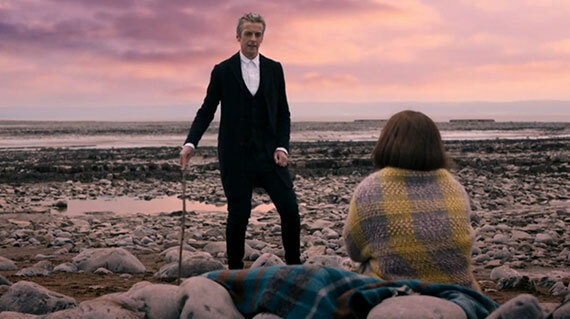 The Doctor and Perkins first bond over their mutual suspicion of one another. By the end, the Doctor’s extended Perkins a coveted invite aboard the TARDIS; Perkins, in spite of having angled for the job, refuses. Obviously, this is because the show can’t afford Skinner as a regular character, but in story terms, Perkins’ explanation (“That job could change a man”) works as a nice counter-balance to the evolving Doctor/Clara dynamic, which we’ll get at below. The TARDIS will not be getting a Chief Engineer. As in Kill the Moon, this episode neatly pivots at the halfway point, when it’s revealed that the Orient Express is a holographically disguised space lab. Gus, up til then only the computerized voice of a locked door, turns out to have orchestrated the whole affair — set up the (non-holographic) passengers to investigate the Foretold, so that its abilities can be reverse-engineered, presumably as a weapon. John Sessions plays the part with sardonic humor (“Grief counseling is available upon request,” he states, after Moorhouse is killed in front of a large audience), but also real menace — Gus kills off the kitchen staff to punish the Doctor for disobeying his rules. Gus only communicates by hand-drawn images on a computer monitor. Is he actually Mark Zuckerberg? Clara: I don’t hate you, I could never hate you, but I can’t do this anymore. Not the way you do it. The Doctor: Can I talk about the planets now? Clara looks great as a flapper, doesn’t she? She wears some good bobby pin in her hair. Darren Mooney on The mOvie Blog does an interesting breakdown about Clara and Maisie failing the Bechdel Test in this episode; locked in a train compartment, they can’t go two minutes without discussing the Doctor. But the Bechdel Test can’t really ever be passed in a Doctor Who episode, can it? Not while the center of the show is an alien Time Lord with the magnetic pull of a black hole. The Doctor and his flapper girl. Clara: So you were pretending to be heartless? 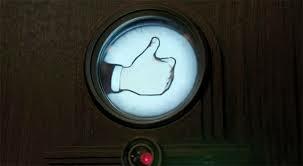 The Doctor: Would you like to think that about me? Would that make it easier? I didn’t know if I could save [Maisie] — I couldn’t save Quell, I couldn’t save Moorehouse, there was a good chance that she’d die too. At which point, I would have just moved on to the next, and the next, until I’d beat it. Sometimes the only choices you have are bad ones, but you still have to choose. For the record, I’d accept that explanation too. Jenna Coleman then at the very end makes the choice to play Clara’s decision (to lie to Danny about staying with the Doctor) as manic, addictive behavior. While this seems a bit out of character to the way Coleman’s played Clara thus far, I have enough confidence in the series to believe that it will have a payoff quite soon. 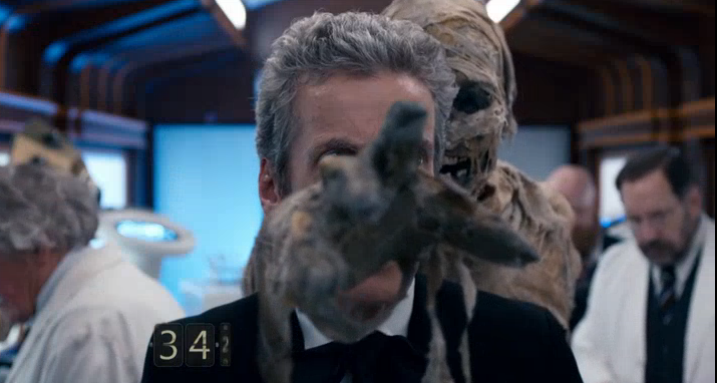 Capaldi’s turned it up past 11 and into 12 here, even in a mere monster-of-the-week script. I enjoy his telling of unconvincing lies, such as when he agrees to go back to Clara’s for occasional dinner visits even after this “last hurrah” trip, a lie so poor that she instantly sees through it. But, even talking to himself, he’s riveting. As Tom Baker used to do, Capaldi talks to himself to advance the plot; his line, “A mummy that only victims can see” sounds, to my ear, a deliberate impersonation of Baker’s voice. Capaldi also silently echo’s the 4th Doctor’s quotation, in 1977’s The Talons of Weng-Chiang, that “sleep is for tortoises”; there’s a nice visual of the Doctor still awake, studying the Foretold, while his pseudo-companions Perkins and Moorhouse have both fallen asleep. And here, he breaks into a soft-shoe routine. And, the callousness. The Doctor does not outwardly mourn any deaths, even the kitchen staff that he’s inadvertently got killed. But he learns from the deaths; he turns Gus’s warning about “less valuable passengers” into the deduction that the Foretold preys on sick passengers. Shortly thereafter, he reacts with evident satisfaction when he learns that Quell will be the next to die — thus giving him a chance to get more information on the Foretold. And Quell turns out to be the final death. The Doctor’s act of noble self-sacrifice is the big “twist”: he copies Maisie’s grief with a medical scanner into his own brain, thus sending the Foretold after him instead. And, as promised, he deduces the Foretold’s origin in exactly one minute; it’s an ancient soldier from a forgotten war, kept alive by malfunctioning tech, and draining the life energies of others. He says “We surrender!” to the soldier… which then salutes him, and dissolves into dust and ash. As Danny predicted, the Doctor really is an officer — but this time, the Doctor respects the soldier. Will this be a character shift going forward? Another week has gone by no mention of Missy, the Nethersphere, or the Promised Land. This is becoming less than an arc: the story of Missy is not being told or advanced; we’re just seeing essentially the same still photographs again and again. This arc, if it is one, is dragging on forever. Meanwhile, Danny’s been relegated heavily to the sidelines the past two episodes, too. If we keep getting episodes like Mummy, the disappearing arc is fine by me. 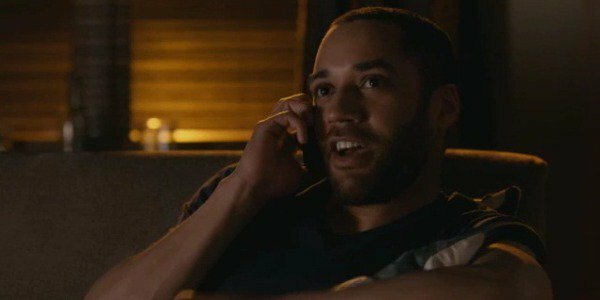 Samuel Anderson is literally phoning it in. The trailers continue to be misleading, as they hid the emotional core of Kill the Moon and Clara’s presence in this episode. Flatline appears from the trailer to be a horror story about Moffat-friendly monsters stranded in the second dimension… but, there will almost certainly be more to the story than that. This entry was posted in 12th Doctor and tagged 12th Doctor, Clara Oswald, Danny Pink, Doctor Who, jamie mathieson, Jenna-Louise Coleman, Novelizations, Paul Wilmshurst, Peter Capaldi, Samuel Anderson, Steven Moffat. Bookmark the permalink. Crap! I was going to wait until the end of Series Eight to discuss the Bechdel Test, but you beat me to it. I think “Kill the Moon” must be the first Doctor Who story to have ever passed the test (three women in a room discussing what to do about a gigantic baby alien inside the Moon that also turns out to be female). In any case, fantastic analysis of this episode. It’s always a pleasure to read your blog posts. Off the top of my head, Barbara and Susan talked in Reign of Terror about how to escape. Anyway, I enjoyed your analysis of the episode. I’m horrible at remembering faces, so I didn’t catch the actors from classic Who in the episode. Like you, I didn’t really miss the lack of Missy in this episode, and you’re absolutely right about her arc not advancing in any way. I’m sure it will all lead to something in the end, but right now I’m almost relieved when she’s not in an episode. Ooh, good catch on the “Reign of Terror” — but, I feel like that should fail the Bechdel Test on general principle, because Susan in general is rather useless and out-of-character, refusing to cooperate in an escape attempt — if memory serves me right! A very late comment, having just run into this blog, but a solid majority of revival era Doctor Who episodes pass the Bechdel test, including this very episode. Clara and Maisie have a conversation about Maisie’s feelings about her grandmother and her recent death. Also from my recollections, most of the early Hartnell episodes did, as Barbara and Susan would usually converse. Same with the Davison era when Nyssa and Tegan were both present. The Seven-Ace era also frequently passed as Ace would generally find some female character to talk to. It doesn’t have to dominate the entire episode, there just has to be a brief verbal exchange between two women about something other than a man. Vast stretches of the classic series went by where the only female character was the companion. “Survival” would have passed the test, obviously, being so Ace-centric.